There is a lot of sudden interest from a photograph and some YouTube videos that are grabbing people’s attention about captive dolphins: the routine practice of cleaning the aquarium tanks by dropping down the water levels. 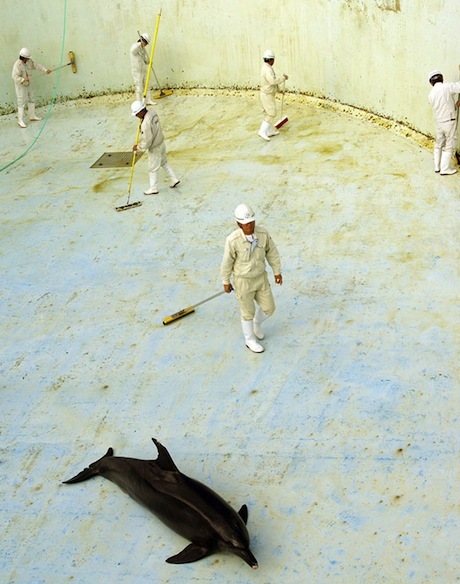 In the process, though, the dolphins in these tanks are stranded on the concrete bottom for a period of time during the cleaning. This does not just happen in all the dolphinariums in Japan (except of course for the dolphins held in netted sea pens, which experience quite different stress from passing boats and water pollution from the harbors), but also happens in aquariums all over the world. Some, like the SeaWorld facilities, have alternative tanks that they can move dolphins into during a tank cleaning. But take a close look at these photos and videos: This is the “habitat” of captive dolphins, including SeaWorld. Once the water is drained, you can clearly see that these dolphins are being kept in sterile concrete boxes. Go to a zoo and look at the Reptile exhibit. You will find that the snakes and lizards have bits of ground cover, limbs to climb on, places to hide and to sun themselves, and a dish of water. Compare these captive habitat conditions to what we have for captive dolphins, and you can see we do more for snakes and lizards than we do for the far more intelligent, gentle dolphins. Why do we continue to abuse dolphins in this manner? We depend on our sight for our interactions with the world. Dolphins depend on sound and their sonar ability. But in a small, bare, concrete tank, dolphins just get bland echoes. Snapped by Chinese photographer Huang-Ju Chen, the undated photo depicts a dolphin lying on the bare floor of an aquarium tank in Japan while workers clean grime and goop off the walls. “I was shocked at how the staff ignored the dolphin and didn’t seem to be in any hurry to refill the pool,” said Huang-Juto to Mongabay. While people on the Internet were incensed, the practice of draining aquarium tanks is apparently quite common. “What you see in these two videos is routine tank cleaning. It goes on at all of the 51 dolphin abusement parks in Japan at least once a month—sometimes twice a month in the summer,” says Cove star Ric O’Barry. 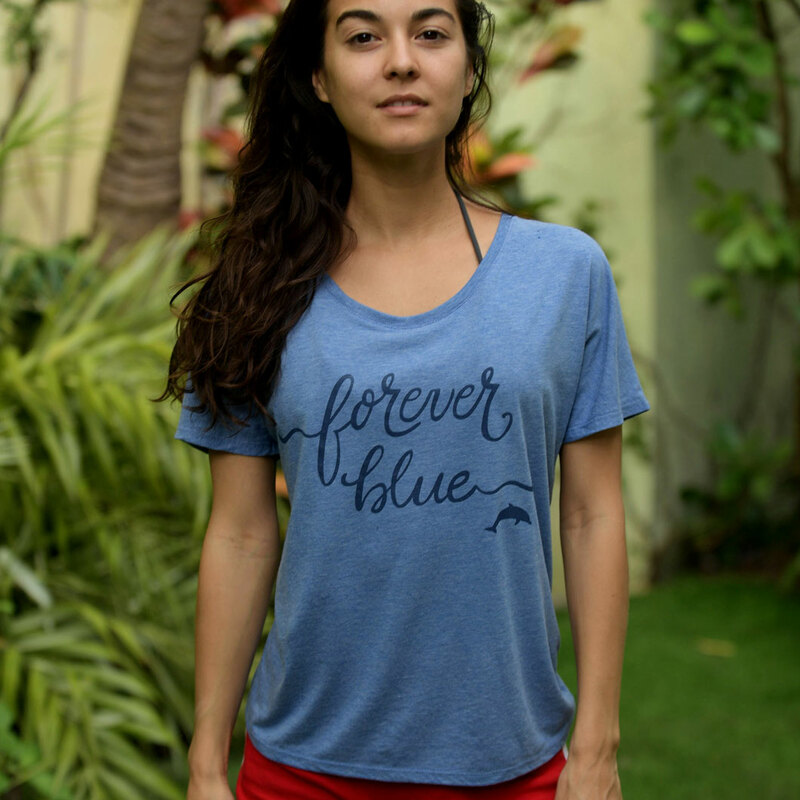 In the open waters of the boundless ocean, a free, wild dolphin can live up to 50 years. A caged dolphin, on the other hand, circles its tiny tank without purpose—often to the point of depression and suicide. Even in the largest aquarium facilities, captive dolphins have access to less than 1/10,000 of 1 percent (0.000001) of the swimming area available to them in their natural environment. Compare and contrast this to the fact that some wild dolphin pods can swim up to 100 miles a day hunting for food, and you’ll begin to grasp why holding one captive in a tank—be it one with water or one where the water is temporarily drained—amounts to nothing more than the cruel deprivation of basic cetacean rights. An Angelino by way of Wilkes-Barre, PA, Sal holds a Political Science degree from George Washington University. Though he began his career in sports, he’s written about all things environment since 2007.